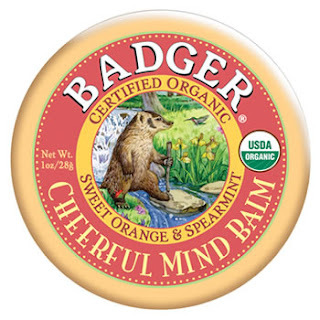 I'm a big fan of Badger Balms, which I first discovered back at university when my flatmate's mum kindly bought us a tin of the good-enough-to-eat Tangerine Breeze Lip Balm each.﻿ The quirky tins are so cute, not to mention handy to throw into a handbag or pop into a desk drawer. New from the brand are the slightly larger tins of Mind Balms. There's a Tension Soother,Clear Mind Balm, Yoga & Meditation Balm and, last but by no means least, Cheerful Mind Balm, which I was sent to try. Cheerful Mind Balm contains essential oils of sweet orange & neroli (renowned for their uplifting properties), lemon, rosemary, spearmint, ylang ylang and cinnamon to name just a few. It makes for an unusual yet pleasant, natural scent. The aromatherapy balms have impressive eco credentials as each is 100% natural and at least 80% organic. I like that the balms are easy to use- simply massage onto hands or temples- so there's no getting to grips with carrier oils and essential oil blends. I tried Cheerful Mind Balm as an alternative to reaching for the chocolate when I felt PMS creeping up on me. It's difficult to say whether the balm itself helped to lift my emotions or if it was simply the act of taking a minute to pause, combined with the soothing action of massage but I certainly found it enjoyable to use. At £5.99, I think these are an affordable and non-daunting way to try out aromatherapy and I definitely want to try the others in the range. Thumbs up.